Russia Using Disinformation To 'Sow Discord In West,' Britain's Prime Minister Says : The Two-Way Theresa May, delivering what has been described as a major foreign policy address, warned the Kremlin that its campaign to "weaponize information" will not succeed. 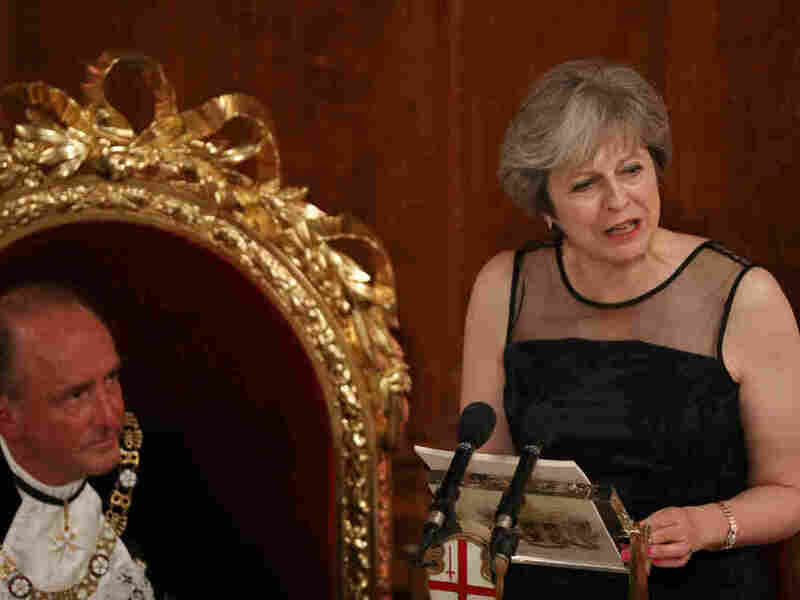 U.K. Prime Minister Theresa May speaks as Charles Bowman, Lord Mayor of the City of London, listens during the annual Lord Mayor's Banquet at the Guildhall, in the square mile financial district of the City of London on Monday. British Prime Minister Theresa May has launched a blistering attack on what she called Russia's efforts to "sow discord in the West," putting Moscow on notice: "We know what you are doing and you will not succeed." In what is being described as a major foreign policy address delivered at the Lord Mayor's Banquet at Mansion House in London on Monday, May said Russia was waging "a sustained campaign of cyber-espionage and disruption." "This has included meddling in elections and hacking the Danish Ministry of Defense and the Bundestag, among many others," the prime minister said, according to the BBC. The Kremlin, she said "is seeking to weaponize information, deploying its state-run media organizations to plant fake stories and Photo-shopped images in an attempt to sow discord in the West and undermine our institutions." May said she had a "simple message" for Russia: "Because you underestimate the resilience of our democracies, the enduring attraction of free and open societies and the commitment of Western nations to the alliances that bind us." The British prime minister's remarks come after a U.K. parliamentary committee launched an investigation into the influence of "fake news" on last year's EU "Brexit" referendum and June's general election. May's strong condemnation stands in contrast to President Trump's continuing equivocation coming over Russian interference in the November election. In just the past few days, Trump initially appeared to say that he believed Russian President Vladimir Putin's denials, only to later backtrack. In a letter last month to Facebook CEO Mark Zuckerberg, the chairman of the investigating committee, Damian Collins, said part of his inquiry "will focus on the role of foreign actors abusing platforms such as yours to interfere in the political discourse of other nations." Late last month, representatives of Facebook, Twitter and Google testified before lawmakers on Capitol Hill. Facebook said that it believed as many as 126 million of its users may have seen content that originated from a Russian disinformation campaign. Meanwhile, Twitter acknowledged that it had uncovered 2,752 Russian-linked accounts and more than 36,000 automated "bots" used to pump out 1.4 million election-related tweets. Meanwhile, NPR's Lauren Frayer reports from Madrid that Spain is the latest country to accuse the Kremlin of spreading fake news aimed at disrupting politics: Lauren tells our Newscasts unit that Spanish Prime Minister Mariano Rajoy says that more than half of social media site accounts spreading "disinformation" about Catalonia have been traced to Russia. And Spain's Foreign Minister Alfonso Dastis has told European Union officials that WikiLeaks founder Julian Assange is trying to "interfere and manipulate" in Catalonia.